There's a subscription box for just about everything these days. There's ones for new beauty treats and subscriptions for your pets; boxes to try new perfumes and ones that will have recipes (and all the ingredients to make it) dropped right out of your door. But it can be tricky to narrow down exactly what it is you're looking for - and to even find one that's not going to break the bank when it comes to shipping. So, we've gathered some of our favourite subscription boxes- from beauty bits to stationary; socks to sweets - that are the perfect mostly pick-me-up. How much does it cost? Beginning at €24.95 for a one-month subscription. 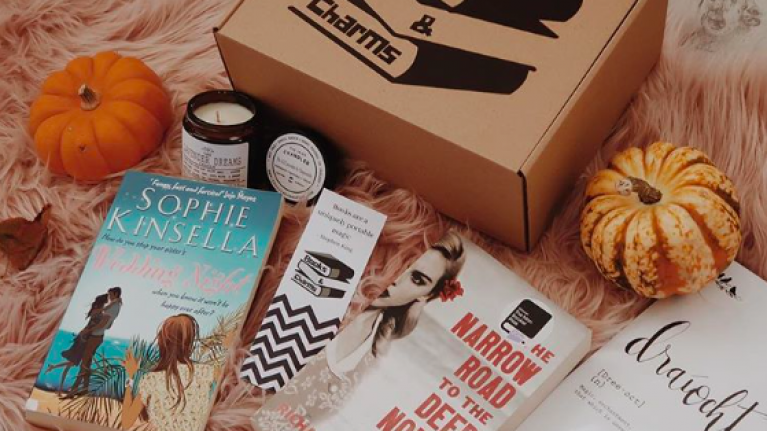 This Irish subscription box is basically a dream come true for fans of reading. It contains two pre-loved books, depending on your favourite genres, and a drink or snack to enjoy alongside your new reads. There are also two or three other "bookish" gifts, which will help your unwind and relax alongside the newest additions to your reading list. How much does it cost? There's a number of options available depending on what you fancy. The general Loot Crate is €28 per month. The main Loot Crate has a featured theme every month - and four pop culture franchises to draw from. There's at least four items in every box, including a t-shirt, figurines and collectables that you won't be able to find anywhere else. But if you want a more specific theme, you can pick up crates like the J.K. Rowling's Wizarding World one or even the Stranger Things one. How much does it cost? They are priced beginning at £17.99 per month, including shipping. If you're the kind of person who likes to experiment with their signature scent, this perfume subscription service is probably for you. Every month, you get a sent a 7ml scent that is based on a "playlist" of your particular likes and preferences. There's six different categories to choose from: Trending Now, Female Classics, Avant Garde, Work/Play, Aesthetic and Clean. How much does it cost? Beginning at €15.12 (including shipping) for a month-by month subscription. Fancy giving your makeup bag a bit of a makeover? Then make sure to check out Birchbox. Each month, you get both full and sample sized products from a mix of well known and new beauty, makeup and skincare brands. The care packages are always themed or a collaboration, with some of the previous designers included Vogue Magazine, Matthew Williamson and Oliver Bonas. How much does it cost? Beginning at £10.95 per month, plus £3.95 for shipping. Because who doesn't love some colourful stationary? From the folks behind Ohh Deer, Papergang promises a box filled to the brim with a number of unique items: from greeting cards to notebooks; desk accessories to art prints (among many others). And it's all for a good cause, as well. The company has partnered with international development charity tree aid - so for every four boxes sold, one tree will be planted in association with the charity. How much does it cost? They're priced beginning at €9.99 for a month-by-month subscription (and depending on your picks). Shipping is free, though. This Ireland-based care package aims to make your period a little easier (and stress-free). Depending on your choices when you first sign up, each subscription box features either pads or tampons (in your preferred brand). There's also some sweets, teas and other treats included, just for the time when you need them most. How much does it cost? Beginning at $11 for one pair. Shipping is free, though. Where can it be bought? sockfancy.com. Do you have a fondness for colourful and patterned socks? Then this is probably the one for you. You can pick from three options - to have one, two or six pairs of socks - delivered to your door. Or, if your'e trying to give your sock drawer a total makeover, there's also a subscription available for couples - which will send you the stripes, colourful socks of your dreams. How much does it cost? Beginning at $35 per box on a month-by-month subscription. It costs $10 USD for shipping to Ireland. Whether you've spent some time living abroad and want to reminisce, or simply fancy trying some new sweets from far away, this one is for you. There are currently four options available - Canada, France, UK and Germany - with Serbian snacks set to be added to the list soon. Each box contains a number of items hard to find outside of the country. While many of them are food, there's also things like toiletries, stickers, shower gels, soaps and more. How much does it cost? Beginning at €19 (including shipping) for a month-by-month subscription. From makeup to haircare and just about everything in between, Glossybox is really the gift that keeps on giving. You get five products every month: a mix of well known and new brands, both in a full size and sample packaging. There's also some one-off, limited edition boxes available to purchase, like their Beauty Case or the Creme de la Mer package.